HARRY LEE: Boat 2541 Way’s Packet Directory page 208. Stern Wheel, steel hull, Packet builtSt. LouisMo., 1915, 175.5 x 36 x 6.7. Engines, 16’s – 6. Three boilers set on her backwards; fired from the deck-room. Owned by the Lee Line, Memphis. Ran Memphis-Helena-Friars Point. In January 1921 she was 40 miles up the St. Francis River(Arkansas). She was built at the Phil A. Rohan Boat, Boiler & Tank Works,St. 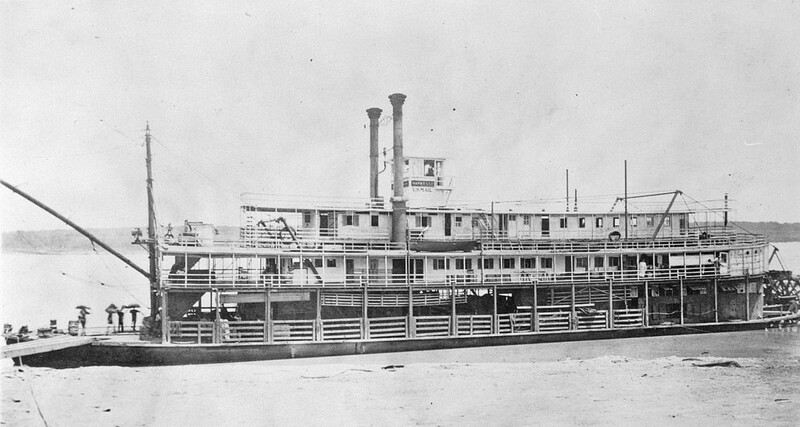 Louis.Last owned by the Valley Line,Memphis, which sold her June 1924 to Sherburne Transportation Co. She served during WWII atAlexandria La., on the Red River as a barracks for soldiers, and was moved from there toOrange,Tex., used to quarter shipyard workmen and burned May 12, 1942. She was then converted into a showboat at Orange and was still there in 1951.